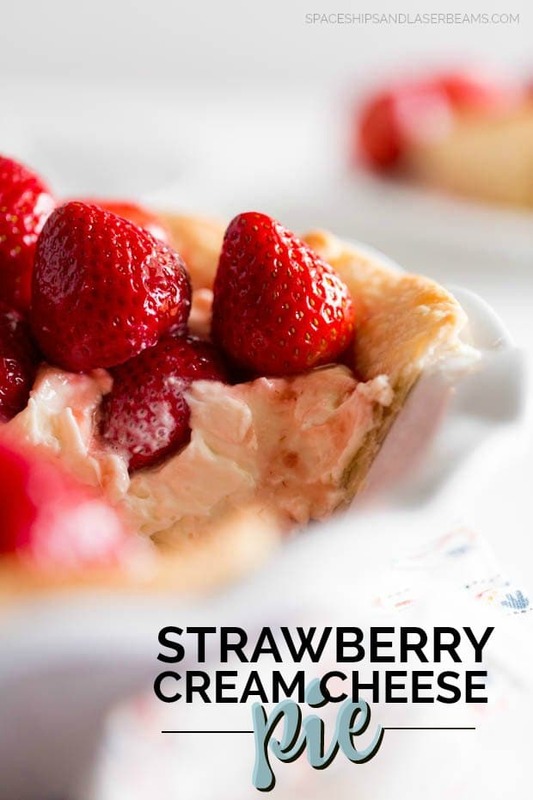 This strawberry cream cheese pie recipe will have you entire family smacking your lips and asking for more. 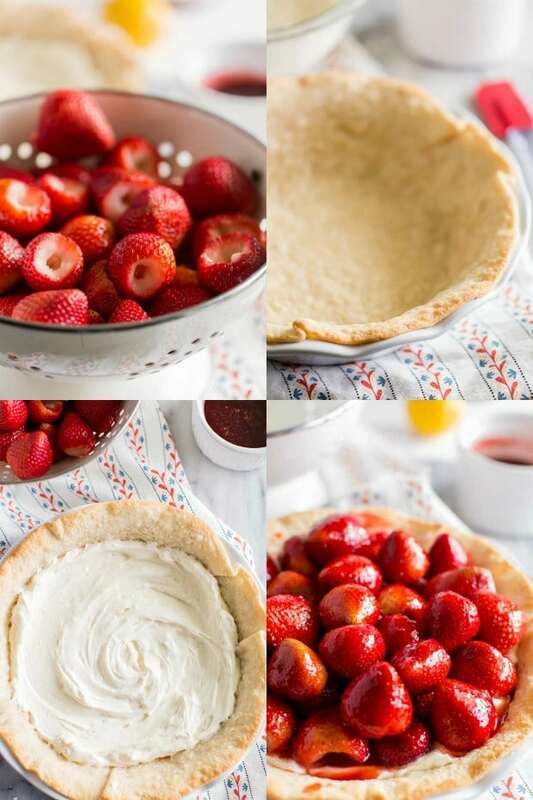 From the flaky crust to the cream cheese base to the fresh strawberries and glaze — it’s the BEST recipe and oh-so-easy. It tastes close enough to a cheesecake, yet is much lighter and requires less attention and work. The only part you need to bake is the crust! (And you can buy a store-made one of you like!) That’s perfect for us. 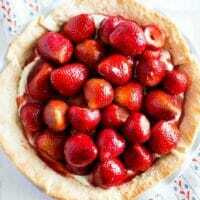 If you want more delicious pie recipes, check out our recipes for No-Bake Strawberry Jello Pie, No Bake Pumpkin Pie or Deep Dish Apple Pie. You might want to curl up in the pantry with the entire dish of this old fashioned dessert and keep it all to yourself it’s so good. The cheesecake layer in the bottom will have you drooling. Seriously. The crust is my favorite part of the pie. Make a delicious crumbly one from scratch or buy your favorite pre-made refrigerated pie crust from the supermarket. Instead of a traditional pie crust, you could also use a graham cracker crust. Other options would be topping it with dark or white chocolate shavings or a chocolate drizzle. Making this simple cream cheese pie recipe starts with the crust. As we mentioned earlier, you can have a base made from scratch or you can use a pre-made refrigerated pie crust dough. Roll out the crust and press the dough sheet into a deep dish pie pan. Poke holes on the bottom and side of the crust with a fork to prevent air bubbles while baking. 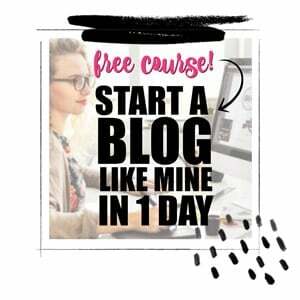 Preheat the oven to 450 degrees and bake the crust for 7 to 9 minutes. Once you take it of the oven, let the crust cool. As the freshly baked crust chills, grab a medium mixing bowl. Whip the heavy cream in this bowl. You’ll know when the whipped cream is done when it can form stiff peaks. Add in the cream cheese, vanilla, and sugar, and whip some more until it is a fluffy and smooth consistency. To make the glaze, take a saucepan and put in the strawberry jelly, lemon juice, sugar, and water. Bring the mixture into a slow simmer and make sure to stir it continuously. Once the mixture is properly combined, remove from the head and let it cool. This gloss will provide the perfect glossy look to your fruit pie. Check that the pie crust is completely cooled, or else the consistency of your filling will be off. Then, fill it with the whip cream cheese filling. Top with whole, hulled fresh strawberries. Once the glaze is cooled to room temperature, coat the glaze over the strawberries completely. Let the pie chill in the fridge for 30 minutes to an hour before serving. Roll out pie crust and press into a deep dish pie pan. Use a fork to poke holes on the bottom and sides of the crust. Bake at 450 for 7-9 minutes. Remove from oven and cool. In a medium bowl, whip cream until stiff peaks form. Add cream cheese, vanilla and sugar and whip until smooth and fluffy. In a saucepan, add strawberry jelly, lemon juice, sugar and water and bring to a slow simmer, stirring until everything is combined. Remove from heat and cool. 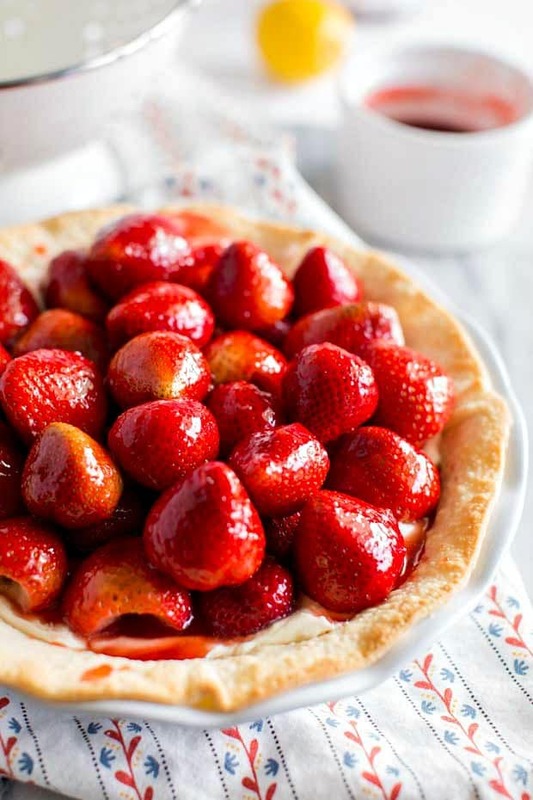 Once crust has cooled, fill with cream cheese filling and top with whole strawberries. After the glaze is cooled to room temperature, coat the strawberries with glaze. Chill for 30 minutes to 1 hour before serving. What a great dessert! It was a favorite in the house.